After a nationwide search, Northern Essex Community College has hired a new vice president of administration and finance. 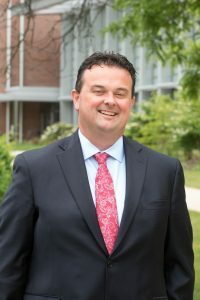 Michael McCarthy of Middleton, MA, currently the chief executive officer of the Essex County Sheriff’s Department, will join the college staff on July 11. He was approved by college trustees at their June 1 meeting. A member of the president’s cabinet, the vice president of administration and finance provides leadership for finance, budgeting, purchasing, accounting and reporting systems, facilities and maintenance, safety and security, auxiliary services, and more. As chief executive officer for the Essex County Sheriff’s Department, McCarthy is currently second in command for an organization with 10 locations, 650+ full-time employees, 200+ contracted vendors, and an operating budget of over $75 million. “Mike’s background is a perfect fit for this very important position at the college,” said NECC President Lane Glenn. “While Mike has extensive experience working in the public sector in Massachusetts, he is new to higher education, which I see as a plus since he’ll bring a new and different perspective to the college. A native of Newburyport, McCarthy is very familiar with Northern Essex, and his father, a retired Newburyport police officer is a graduate. McCarthy has a Bachelor of Arts in Political Science from Tufts University and a Master of Science in Administration from Boston College. He has worked at the Essex County Sheriff’s Department since 2000 and, before being named chief executive officer, he was assistant budget director and chief financial officer. With campuses in Haverhill and Lawrence, Northern Essex Community College offers over 70 associate degree and certificate programs as well as hundreds of noncredit courses designed for personal enrichment and career growth. More than 6,600 students are enrolled in credit associate degree and certificate programs on the Haverhill and Lawrence campuses; and another 3,400 take noncredit workforce development and community education classes on campus, and at businesses and community sites across the Merrimack Valley. Northern Essex is the only state college located in the lower Merrimack Valley Region of Massachusetts. For more information, visit the website at www.necc.mass.edu.